I watch him carefully as he speeds by me. 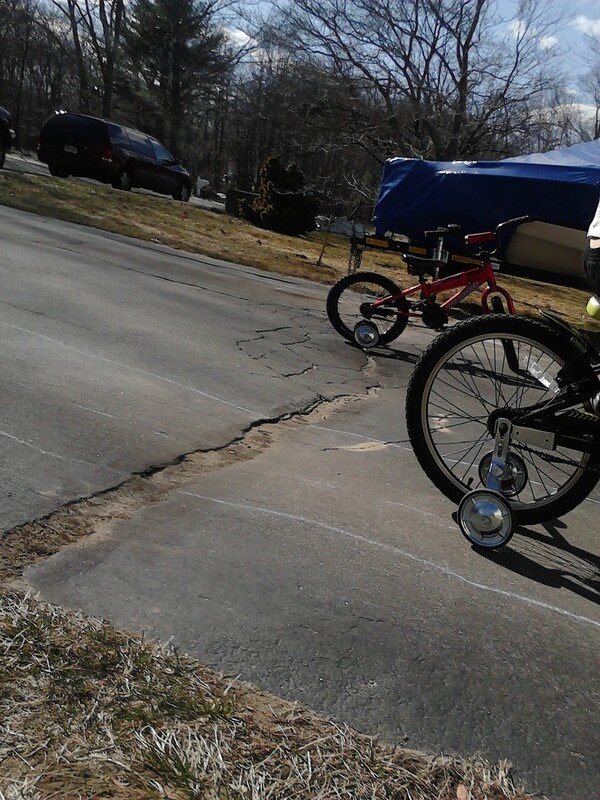 His training wheels clank-clank as they hit the uneven pavement in our driveway. 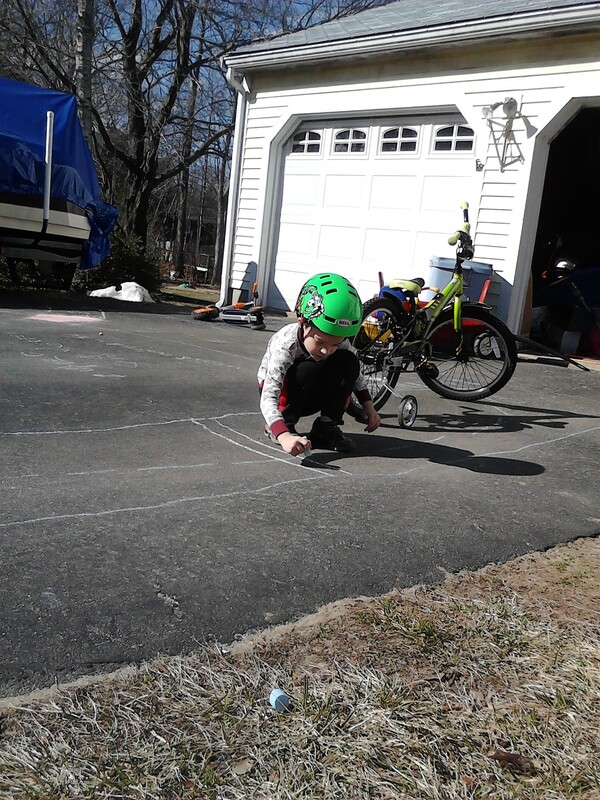 He’s doing laps on a track he made out of chalk. One big circle. Around and around and around. I’m sitting in my winter coat on a beach chair on our lawn. It’s the first nice day of spring but there’s still a chill in the air. His brothers have gone in for the day but Howie refused. “I’m not done”, he said. I think about Autism Awareness Month. Or Autism Acceptance Month. Or Autism Awareness/Acceptance Month. I think about the posts I have written in the past. What it mean to us to “Light It Up Blue“. Why I share what I share. I think about what the words awareness and acceptance really mean. I mean really really mean. And whose awareness? Whose acceptance? Globally? Nationally? In my town? Howie stops for a moment and gets off his bike. He surveys the track. I can see it in his eyes that something is missing. Something about the track is not quite right. I can’t see it. To me, it is perfect. The lines may not be straight, the arrows showing the right path are jagged. His eyes see things I can’t. His mind works differently than mine. He can create elaborate pictures and structures in his head and put them together with Hot Wheels Tracks, Legos, blocks and chalk. I can’t draw anything but a stick figure. I can sit through a two hour lecture on the history of New York’s geography. He can’t sit through a five minute lesson on contractions. I am aware of this. But is he? Howie adds one more line to the track and colors it in. 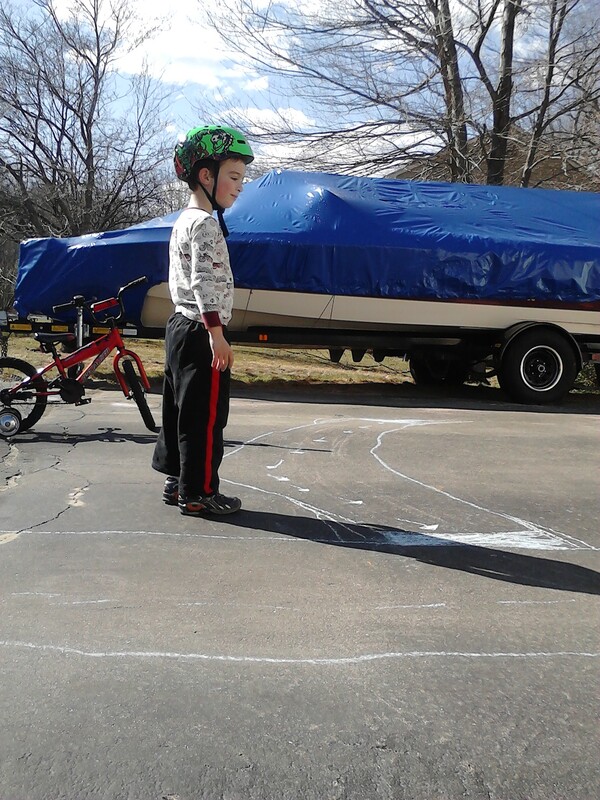 He hops back on his bike and the circles begin again. I know the statistics. The 1 in 88 or 1 in 50. Or in my house…the 2 out of 3. The answer to the question of whose awareness and whose acceptance is easy for me this year. We’ve started talking about how his brain works differently than others sometimes. How some things are harder for him at school and somethings are easier. We’ve talked about sensory overload and calming our engines and using his sensory toolbox to help his body feel better. But…we’ve never given it a name. Up to this point, we have been his advocate. I have piles of papers and notes and spreadsheets and doctors’ reports that speak for him. It’s time to teach him how to speak for himself. How to advocate for what he needs and why. Not to escape the hard work or to use as an excuse. But to truly understand what makes him successful. What makes things challenging. So if a kid makes fun of him for flapping his arms up and down when he’s excited, he can say why he does it. Or if an adult makes him look at them in the eye he can explain why that’s hard for him. Or when he creates the most incredible stories and drawings he can explain why his brain works the way it does. Or when he just needs to ride his bike around in circles for an hour before dinner he knows why it makes him feel happy. His older brother Gerry has accepted it. Tim and I have too. 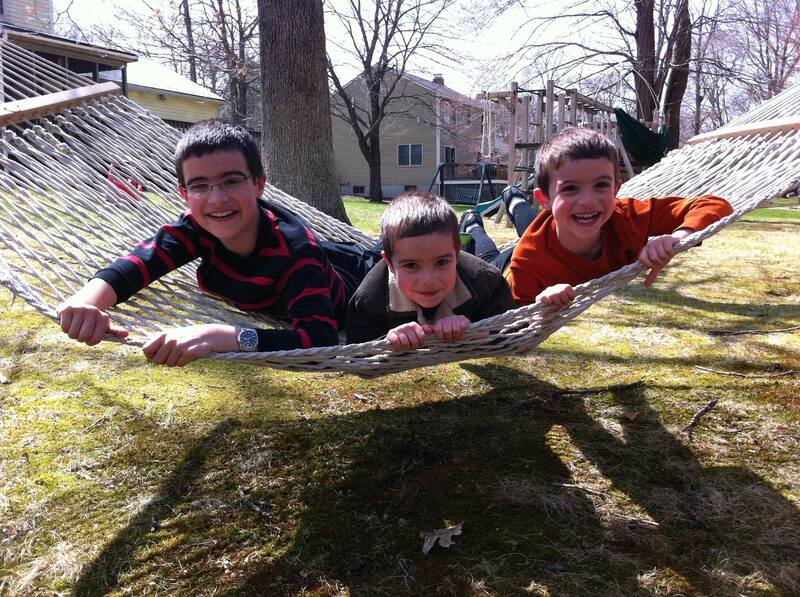 We can share our version of Autism Acceptance Month as parents and siblings. But the understanding/awareness/acceptance needs to come from within too. From Howie himself. We will light our house up blue and wear our blue clothes tomorrow. And slowly…in our way and in our time…Howie will understand that we’re doing it for him and with him and his younger brother. Awareness and acceptance will begin at home. And then Howie can be the one to share it with others. He zips by me again for the 100th time. The early spring wind is starting to kick up and I start to shiver. 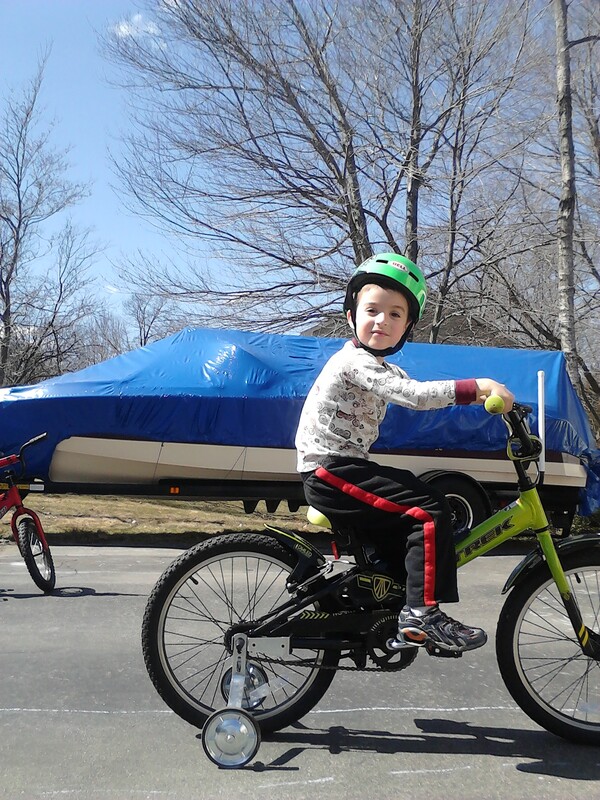 I ask him to pause for a moment so I can take a picture of the first bike ride of 2013. He stops, smiles, and poses. “What are you thinking about?” I ask. “I’m thinking about being me,” he replies. And he speeds away. The clank-clank of the training wheels follow behind. Starting locally. So he can share globally.